Have you seen the previous article on the Rembrandt and Van Gogh paints? Or you would like to get some painting tips from the Dutch Master? Even if you’re just interested in some fun facts about painters and techniques; curious what chiaroscuro means, or why it is so soothing to look at Rembrandt’s paintings, keep reading! Rembrandt started attending the University of Leiden when he was 14 years old, but as he found art more interesting than his studies, he left for Amsterdam to master his painting skills. Not long after he returned to Leiden, at the age of 22, where he started teaching art. Rembrandt's famous painting Night Watch is actually a nickname standing for tediously long original title – funnily enough, the painting is actually set at daytime, only the old dark and dirty varnish made it look nocturnal. In 1715, the forementioned painting was supposed to be brought to the town hall of Amsterdam. However, it was so big that it couldn’t simply fit on the wall – therefore, to hang it, it had to be cropped, and in its present state it’s actually missing some parts. There are many reasons why Rembrandt’s paintings stand out from others, but one is definitely the phenomena of “guiding the eye”. Apparently, Rembrandt’s painting technique enables the viewers’ eyes to be directed throughout the paintings on a specific route, as if Rembrandt consciously wanted to present a certain narrative by making sure where his paintings “begin and end.” As the study – mentioned in the article “The Magic of Rembrandt’s Painting Technique”- shows, it has been confirmed scientifically that Rembrandt knew how the human eye works, and did actually guide the viewers’ eyes with his brushstrokes. Chiaroscuro, meaning “light-dark” in Italian, is technique used to create contrastive effect, especially in painting. Moreover, it’s not simply the strong contrast of light and dark surfaces, but according to Tate Britain’s Glossary, the chiaroscuro technique is “generally only remarked upon when it is a particularly prominent feature of the work, usually when the artist is using extreme contrasts of light and shade"
The effect of Chiaroscuro is very characteristic of Rembrandt’s paintings; he usually used dark shades of browns for shadows and pale yellow tones with white highlights to achieve an illuminating effect, as if his subjects were the sources of light. What was Rembrandt’s colour palette? 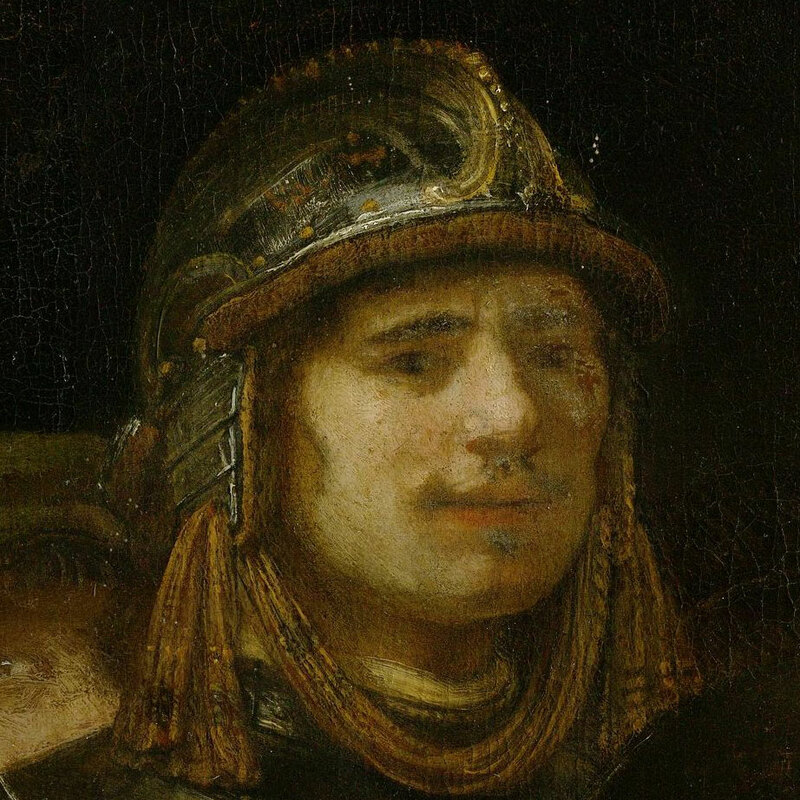 How can I paint like Rembrandt? Well, naturally, to acquire such skills as Rembrandt’s, you probably would’ve need the expertise of the master himself. Although, perhaps with some help of these videos you can learn the technique and pretend you’re a contemporary of the Dutch Baroque painter. Fortunately, Rembrandt wasn't only a talented painter: he took an interest in this particular printmaking technique - and became quite known from his etchings as well. In fact, he produced almost 300! Interested in printmaking techniques? Keep your eyes on the website, or sign up for the newsletter to hear about the arrival of the article! This entry was posted in Blog Home, Videos, Articles and tagged rembrandt, rembrandt oil, printmaking, Night Watch, Chiaroscuro, painting techniques, etching on December 23, 2016 by Zsofia Jakab.